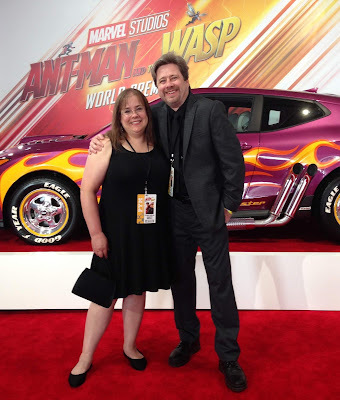 At the Ant-Man and the Wasp premiere! I haven't blogged much at all this year, because I've been busy writing — five different projects at various stages, none of which can be announced — and I've also been traveling, including to another fun Joliet Star Wars Day and a very successful All-Star Comic Con in Tysons Corners, Virginia. But it's the most recent trip that's worth a photo journal! As I mentioned here last year, Marvel Studios included Sonny Burch, the technology-stealing nemesis of Tony Stark from my Iron Man comics run, as one of the main villains for Ant-Man and The Wasp. 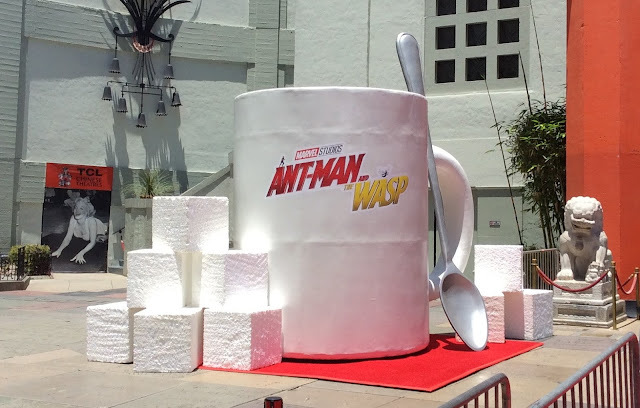 This was the second major character to come from that story, as reporter Christine Everhart appeared as the reporter both in the first two Iron Man movies — and also in the teaser material for the original Ant-Man film, where she interviews Paul Rudd as Scott Lang. Actor Walton Goggins puts his own spin on the character, but operating inside the law — as he mostly did in the comics — or outside of it, Burch remains a technology thief, and it's a much more substantial role. So it was that Marvel invited my wife and me to Hollywood to see the World Premiere. My first one of these, and it was a complete blast. 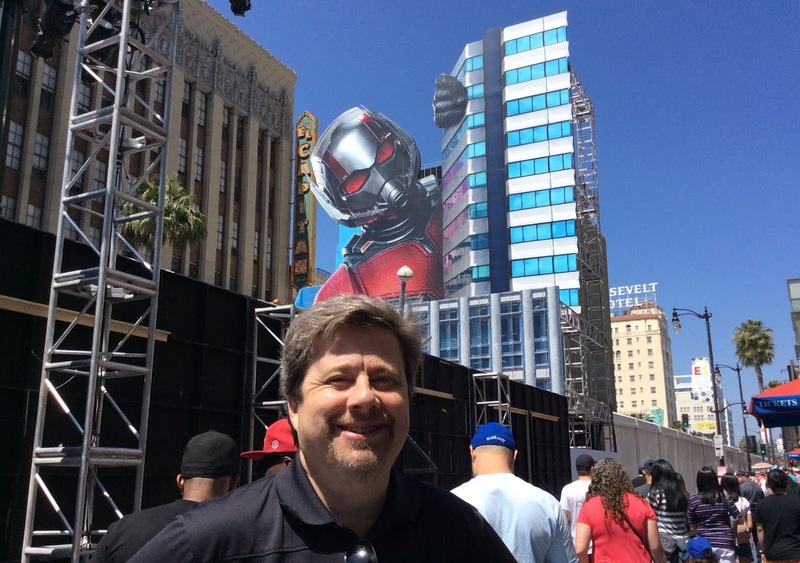 The studio had closed off Hollywood Boulevard in front of the TCL Chinese Theater and the El Capitan, which simultaneously debuted the film. Jorge Lucas, Ant-Man, and JJM! You can see the official footage from outside the premiere here — but some personal highlights included seeing Tony Isabella, whose work I had edited at Comics Buyer's Guide; he'd worked on the Bill Foster character, who was played by Laurence Fishburne, many years earlier. It was good to see Bob Layton, who'd created another movie character, The Ghost, and whose comics with David Michelinie had gotten me into Iron Man in the first place. 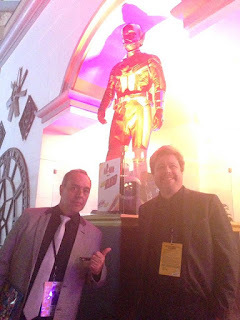 And in possibly the biggest surprise, who should sit down beside me in the theater but Jorge Lucas, the artist with whom I had created those Iron Man comics fifteen years ago. We had never met, in all that time, and had not really had a chance to talk since. 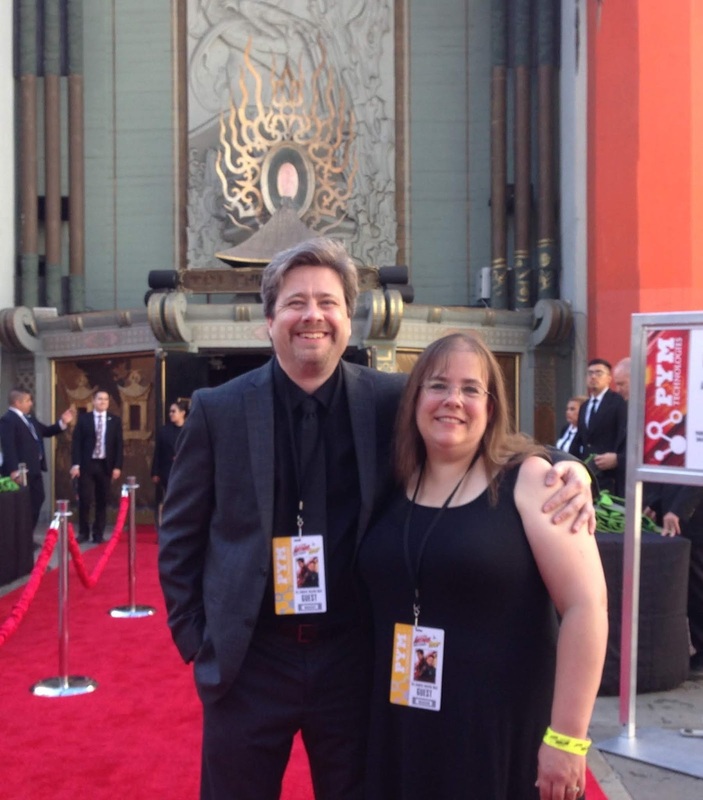 It was a bit of a surreal experience for both of us to be there, but a fun adventure nonetheless. Mark Hamill had asked fans on Twitter to clean his star. Mission accomplished! When you ask for a grande at Starbucks in Hollywood, this is what you get. On the red carpet, in front of the TCL Chinese Theater. 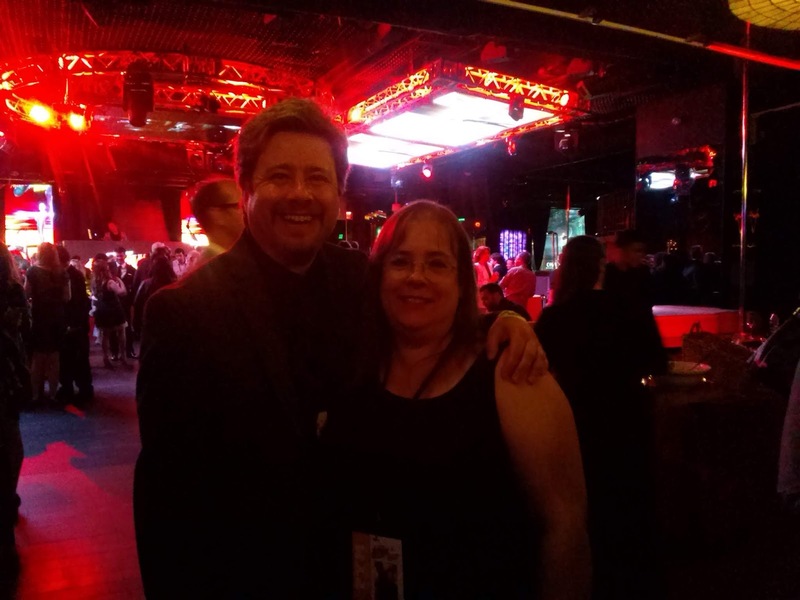 And at the afterparty. A night to be long remembered! 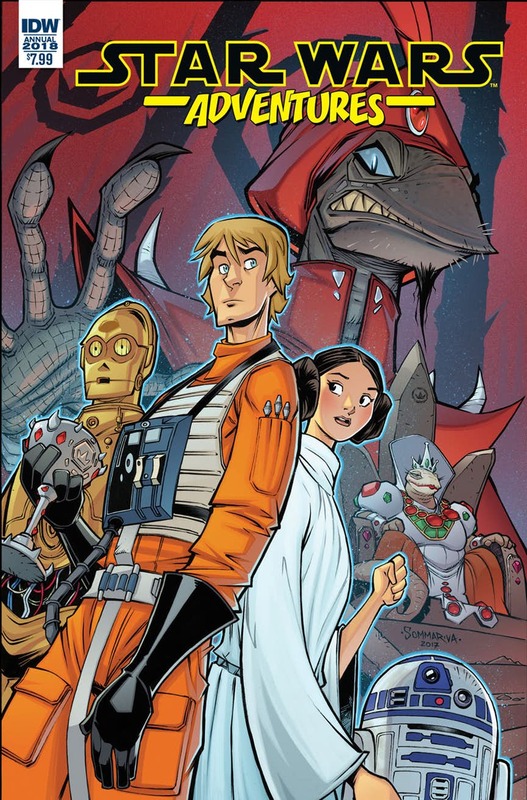 I return to Star Wars comics in IDW's STAR WARS ADVENTURES ANNUAL 2018! Jedi are trained diplomats, but farmboys? Not so much! But Luke has to learn in a hurry as he's forced to pinch-hit for Leia on a diplomatic mission of major importance to the protocol-obsessed Sarkans — and even Threepio might not be enough to save him from starting an intergalactic incident! Will Leia have to bail him out? I share the story in Star Wars Adventures Annual 2018, releasing April 4 from IDW to comics shops everywhere. 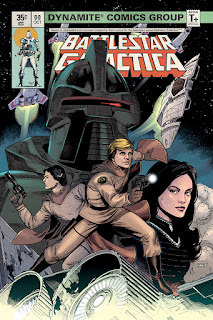 I'd spoken of my return to Star Wars comics last fall with a story I'd just written; rather than serialize the tale, IDW decided to showcase it by building a special edition around it, with some additional surprises. My story is drawn by Jon Sommariva, who also drew the cover at right. The issue releases April 4. It's got order code FEB180374 when you request it at your comics shop. 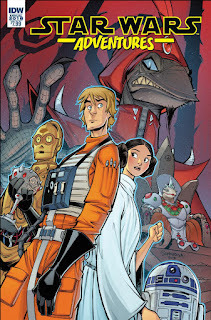 It's terrific seeing the Annual happen, and fun to see it announced twelve years to the week after Knights of the Old Republic #1 went on sale. 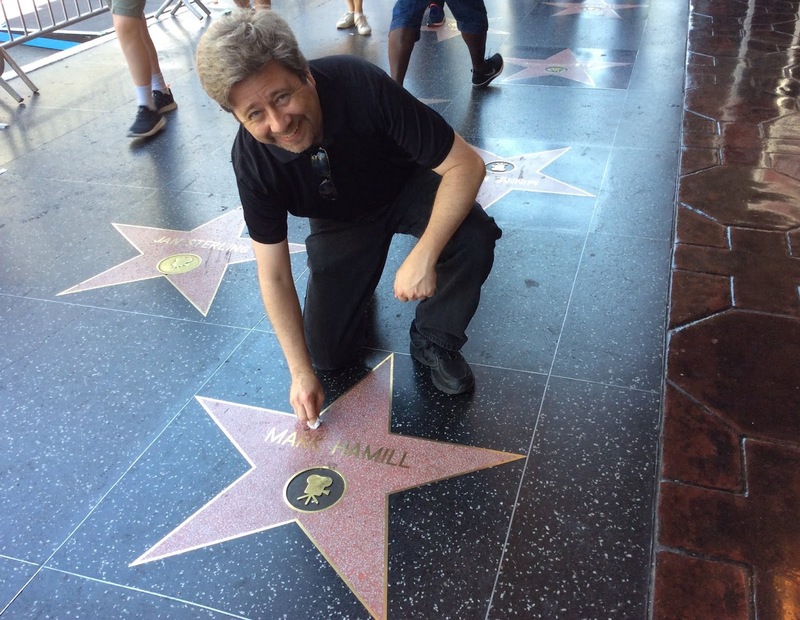 Luke Skywalker was in some ways a template for Zayne Carrick; it's delightful to get to write the character himself. Amazingly, apart from one flash-forward page in KOTOR #25, I'd never written Luke, Leia, or the droids before. And this story is actually a spin on one of the earliest Star Wars ideas I'd ever concocted, but never had the chance to write. I can't wait to see it! There'll be preorder links here once they're available, but you'll be able to order the book starting in February from your retailer. 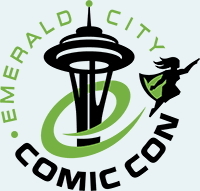 Also, I recently announced that I'd be at Emerald City Comic Con in Seattle March 1-4, appearing for Del Rey — that's a convention I've never attended before and had always wanted to visit. Well, there's some additional news: I'll be at the charity Worldbuilders Party, a gaming event from 7-11pm on March 2. There will be games, snacks, and a silent auction, all to raise money for charity. Tickets are available at worldbuildersparty.com. If you've ever wanted to play me in a Pazaak game — as seen in the KOTOR computer game and my own Canto Bight book — now's your chance! Finally, closer to home, I have a library event Saturday, Feb. 3 at the Little Chute Library in Little Chute, Wis. Click for details!